Stir together all the ingredients for the marinade and cover the salmon in it. If time allows you leave it in the marinade for 15-20 minutes from each site (or over night). Remove the filet and let it drip before placing it on the rack. In the Steakreaktor we now want to broil the filet medium. In my case that took 45-50 seconds from each side (highest temperature, highest rack). However, this strongly depends on the thickness of your filet. Luckily, in the Steakreaktor, you can watch the fish simmer until it's done. It still takes some practice, but I'm sure you'll manage. If unsure broil it for a shorter time than you think it'll take and check it from time to time. The fish shouldn't be raw anymore but have a slight touch of pink. 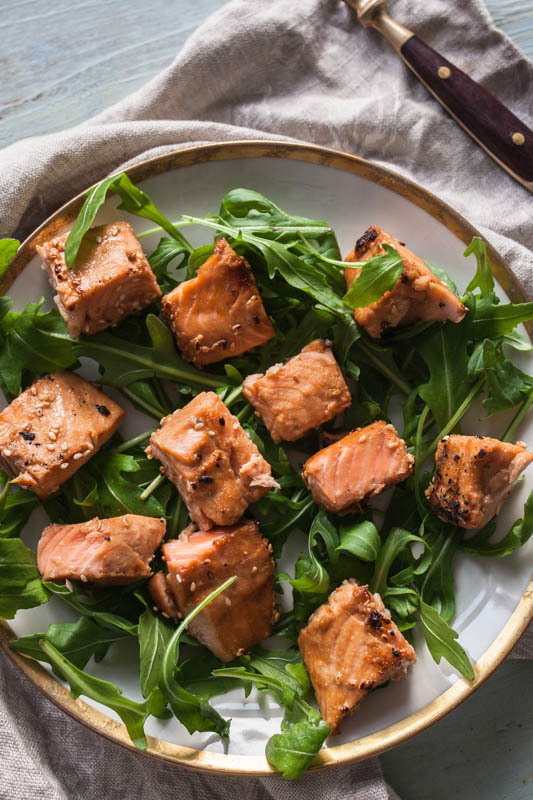 If you're not in a rush you can wrap the salmon in baking paper and broil it in the oven for 20 – 30 minutes at 80°C / 175°F. For a nice crust broil it in the Steakreaktor for mere seconds on the highest rack at 850°C / 1562°F.